For surfers, divers and swimmers alike, wetsuits provide benefits and added protection against the elements. Without the invention of this apparel, many individuals would find their ability to participate in ocean adventures vastly limited by the temperature and climate of the area. The very best wetsuits can allow access to even the coldest waters with little to no discomfort but for most people, a more moderate wetsuit will suffice. Throughout this article, the main concepts will be covered such as the types of wetsuits available, how wetsuits work, what sizes and thicknesses are available as well as other miscellaneous information about wetsuits. 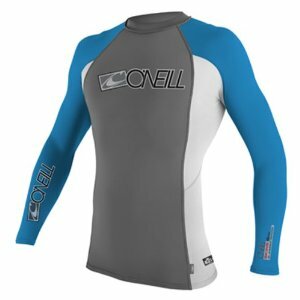 Wetsuit Top – An extremely thin (1mm thick) neoprene suit that covers the upper torso including the arms. Also known as a rash vest, it can be long-sleeved or short-sleeved and is one of the best wetsuits for summer sports such as surfing. Wetsuit Vest – Similar in design to the wetsuit top, the wetsuit vest is typically thicker and lacks sleeves. Shorty Wetsuit – A body wetsuit that covers the whole body except for the arms and legs below the elbows/knees. Spring Wetsuit – This is similar to the shorty wetsuit, but has full length covering on either the arms or legs. Spring wetsuits are typically comprised of thicker neoprene. Short John Wetsuit – Designed for summer use, this wetsuit covers the legs down to the knees and the body. No arm covering is offered with short john wetsuits. Long John Wetsuit – Used in springtime, this design covers the body and legs fully but not the arms. Full Wetsuit – this covers the whole body and is usually worn during the winter months. Dry Suit – used for extremely cold waters. Extra training is often required before wear. The very best wetsuits available find themselves in that category precisely due to the functionality that they offer. Wetsuits work by allowing a small amount of water to enter the suit and be held between the neoprene exterior and the body. As a result, the body warms the water and creates a lasting heating effect that can withstand even normally frigid waters. Due to this dynamic, it is crucial that the wetsuit fits appropriately as too much water entering the wetsuit can lead to hypothermia as the body is only capable of heating a certain amount of water surrounding it. There are additional measures that can be used in combination with the best wetsuits for increased protection from the elements. The most common accessory for this is called a batwing, which is a thin extra piece of neoprene that fits snugly between the body and the wetsuit zipper. This piece of neoprene reflects extra water that is absorbed and redirects it outward through the drain hole at the bottom of the zipper. For those who are wondering how to choose a wetsuit that best insulates and fits properly, reference the following section to become familiar with traditional wetsuit sizes and thicknesses. Wetsuits work by adhering to the body in a tight fashion, so one of the most important aspects when it comes to how to choose a wetsuit is to make sure that the appropriate size has been selected. Wetsuits do not fit like normal clothing; in many instances, the best wetsuits will be uncomfortable as a result of them fitting the body properly. Always make sure that the wetsuit in question fits well around the ankles, wrist and neck. There are thirteen standard wetsuit sizes, with each taking into account height and weight along with chest, waist, arm and leg dimensions. One thing to keep in mind is the thicker the neoprene, the warmer you will be. Typically, thinner wetsuits are used in the summer and autumn while thicker ones are used in the winter and spring. If the water is above room temperature, the best wetsuit to use would be one that is 3 mm thick or less. Below room temperature, a 5 mm wetsuit is recommended and a 7-9 mm wetsuit is needed for water that is below 50 degrees Fahrenheit. Remember that the thicker the suit, the less mobile you will be, so it is important to have a wetsuit that is optimally designed for the temperature of the water along with the activity in which you are taking part in. Wetsuits typically have zippers, but some come zipper-free for the most insulated effect achievable. Since zippers let water flow in and out of the suit, it is important to consider the size of the zipper depending on the suit. For cold excursions, a smaller zipper is best. Most retailers of wetsuits will be able to provide you with information that pertains to the quality, insulation capability and elasticity of the neoprene used in any given brand of wetsuit. The best wetsuits will have high insulation and a generally decent amount of elasticity built into the design. Wetsuit numbers often appear in the specifications and can be confusing if you do not understand what they mean. For example, a “3/2” wetsuit is comprised of layers of 3 mm and 2 mm thick neoprene (best for summer due to its thin design), whereas a “5/3” wetsuit is comprised of layers of 5 mm and 3 mm thick neoprene and is among the best wetsuits for winter and spring use. There are several types of stitch patterns available with wetsuits and when it comes to knowing how to choose a wetsuit, the specific stitch pattern makes a difference. Common stitching patterns include over lock, flat lock, blind, and even liquid tape may be utilized to further seal the suit. Ultimately, a wetsuit rated as one of the best wetsuits may not be the best wetsuit for you. Whether you are surfing, diving or swimming and whether you are doing this in spring, summer, fall or winter will usually determine the type of wetsuit you require. Always shop around and use the information above to help guide you to the proper design for your specific circumstances. This entry was posted in Featured, Scuba Diving, Surfing, Water Sports and tagged featured, Wetsuit. Bookmark the permalink.